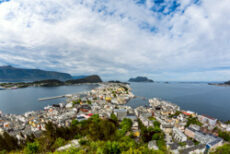 Ålesund is adventure capital of the Fjords, named Norway’s most beautiful city. On three islands and between two bright-blue fjords lies Ålesund, home to 45,000 inhabitants and one of Norway’s largest harbors for exporting dried and fresh fish. It’s just a short ride with the Coastal Steamer away from the unique UNESCO heritage listed Geirangerfjord. A devastating fire on the 23rd of January 1904 left more than 10,000 people homeless. A new town rose phoenix-like from the ashes – in the distinctive Art Nouveau style, which incorporates natural forms and soft lines. You see this reflected in Ålesund’s buildings, many of which have flowers and other swirly shapes on their exteriors. The architects who designed the houses were young Norwegians, influenced by both national romantic ideas as well as that time period’s popular architectural style – the Jugendstil or in English Art Nouveau. Ask for the Ålesund walking guide leaflet at the tourist information to make sure you don’t miss out on the most important sights in town. Some of the most spectacular buildings are located around the area Brosundet, in Kongens Gate, Brunholmen and Kirkegata. You can walk from one end to the other in less than 20 minutes, but be careful with your heels as these streets are cobbled.